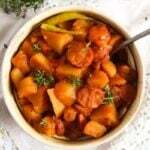 A super easy and delicious potato stew with cabanossi sausage and vegetables, a typical Romanian recipe for potato stew. Like the Easiest Skillet Macaroni and Cheese, the Simple Chicken and Vegetable Pilaf and the Easy Pork Meatballs in Tomato Sauce, today’s Easy Potato Stew with Cabanossi Sausages and Vegetables is another staple in my grandmother’s kitchen and in the Romanian kitchen generally. Potato stew or Tocana de cartofi is something you will never find on a restaurant menu, but it is something you will get to eat in every single household in Romania, even the name tocana de cartofi has for me such a strong meaning, it is almost like a word in itself, describing something so stable and so natural, so obvious, almost like a word naming a thing like a bed or a table etc. Am I making any sense? 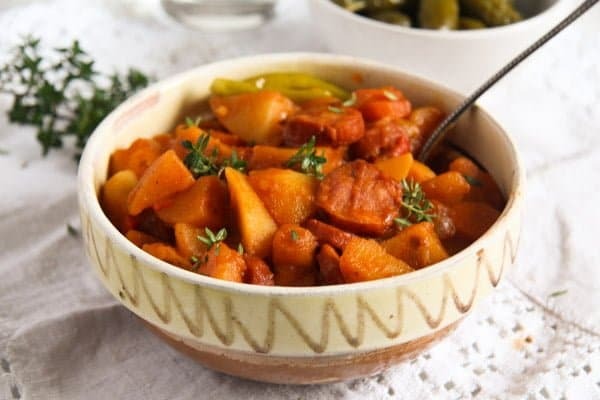 I could not even imagine how many times I have eaten potato stew in my life… thousands of times probably, it was after all, one of the cheapest meals you could imagine, something suitable all through the year, especially in winter when vegetables were scarce and expensive. 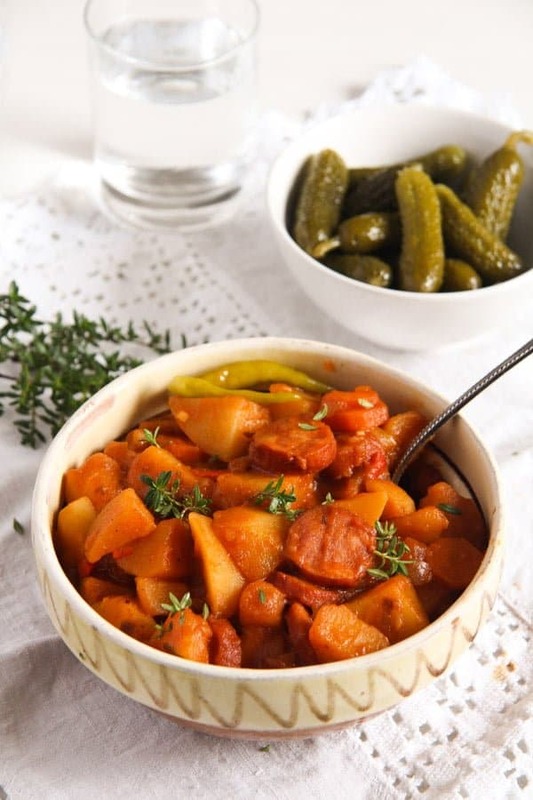 So, we had lots of potato stews and other simple potato dishes in the winter, mostly accompanied by pickled vegetables and white bread. Yes, white bread, eating potato dishes with white bread was normal for us, my husband still gets a wondering look in his eyes when he sees me with a tiny piece of bread in my hand each time we have potato stew. Not that I need it, but it is the habit, the comforting childhood memories, I suppose. 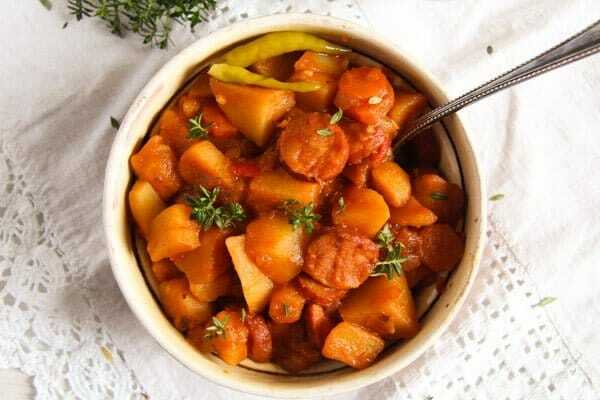 However, unlike all the previously mentioned recipes, which were my grandmother’s originals, the recipe for this Easy Potato Stew with Cabanossi Sausages and Vegetables is not really my grandmother’s. I liked her version and I make it from time to time as well, but not too often. Instead I prefer my own version of the potato stew. I used cabanossi for today’s Easy Potato Stew with Cabanossi Sausages and Vegetables, but any sausage kind you have or like would be OK. 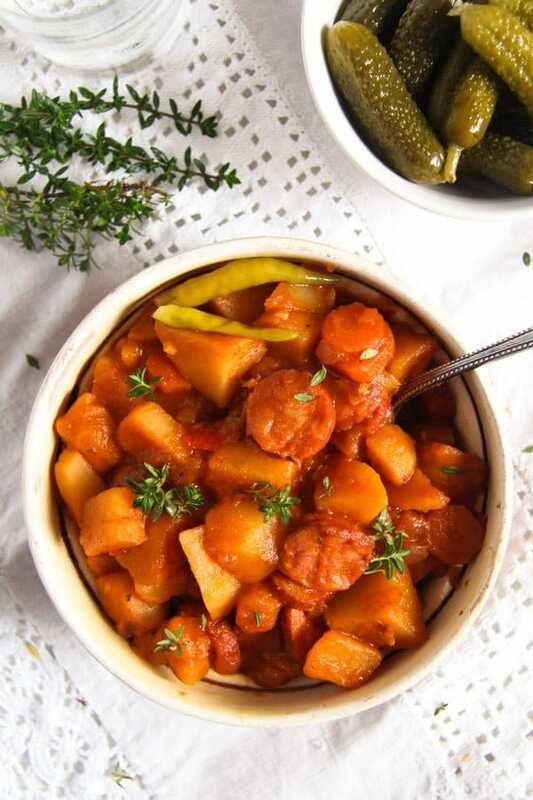 I have already made this potato stew with frankfurters, chorizo (quite spicy), typical German sausages like bratwurst, grilling sausages or smoked sausages. Sometimes, when I have leftover already grilled sausages from a garden party or another fest, I cut those in slices, make a potato stew and warm the slices in the stew. Quick and delicious! And if you want to make this dish vegetarian or vegan, just leave out the sausage. You can replace it with more vegetables, you could add some frozen peas or some canned beans and there you have it: a perfectly delicious, cheap and healthy meal! Otherwise, I hope you are having a wonderful pre-Chritmas time! Chop the onion and the garlic clove finely. Slice the carrots, chop the red bell pepper into small cubes and the leek into thin rings. Peel and cut the potatoes into regular cubes.
. Give the onion to the pot and fry until translucent. Add the garlic, carrots, bell pepper and leek and cook, stirring a few times in between, for about 5 minutes. Add the ground paprika, tomato paste, potatoes and marjoram and stir well. Add some chili paste to taste if you want the dish to be spicier, but that is optional. Add about 500 ml/ 2 cups of the chicken stock or as much stock to barely cover the potatoes, stir, cover the pot and let cook on medium low heat for about 10 minutes or until the potatoes are half cooked. In the meantime slice the cabanossi. Give them to the pot and continue cooking for 10 or 15 minutes until the potatoes are soft. Add the rest of the chicken stock (or water if you are out of stock) if the liquid cooks down too much, it should not get dry, there should be quite a bit of sauce in the pot. If the sauce is too thin towards the end of the cooking process, remove the lid from the pot and continue cooking the stew until the sauce thickens slightly. Adjust the taste with salt and pepper, sprinkle with chopped parsley or thyme and serve with pickled vegetables or salad. 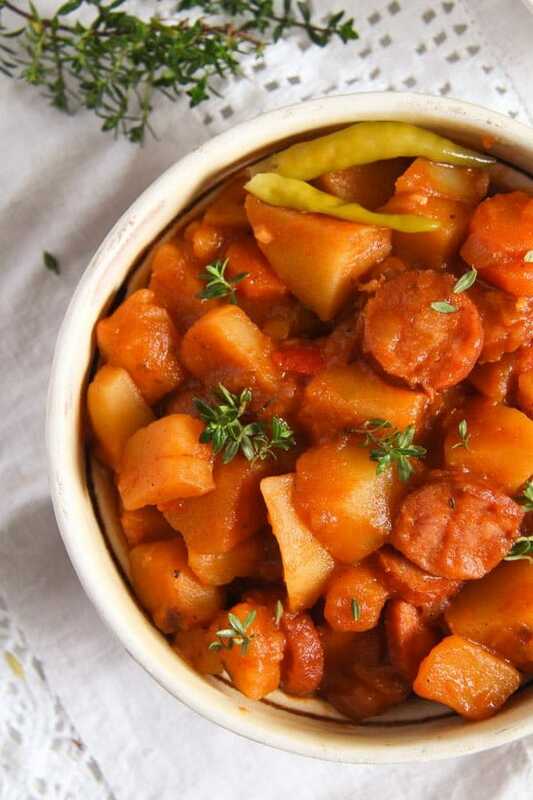 Sausage and potato…a soul comforting and delicious combo! Perfect for the cold winter days! Happy holidays and Merry Christmas to you and your family! Merry Christmas to you too, Katerina. Mmmm. This looks and sounds delicious with the sausage, which adds so much flavor. How lucky you are to have so many wonderful recipes from your grandmother. So fun to be able to take her original recipe and add to it. I hope you and your family enjoy the holidays.